If you are looking for a 1 1/2 year old trained dog to hunt this season Dale Roberts in Texas @ 432 209 4225 has a young trained NASTRA dog he is selling. Steady to wing and shot and retrieves. this dog is being sold to make room for up and comers for competition. He will be a perfect hunting companion for the foot hunter. Call Dale at 432 209 4225 for details on this dog. 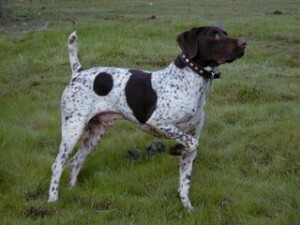 price of this dog is $4500 and has been hunted plenty of quail in texas. Dale was the proud owner of FC/AFC/5 x Reg CH Robert’s Royal Wrangler we were lucky enough to campaign for him so Dale knows dogs. NFC/FC/7X Reg CH Tonelli’s Rising Sun daughter wins 2010 NSGPA “National Championship” and a son garners “Runner Up ” in the 2010 NGSPA National Shooting Dog Championship in March of this year ! “Flash ” wins 52nd running of the National German Pointing Dog National All Age Championship. Palermo Ranch Kennels reserves the right to refuse service to anyone.